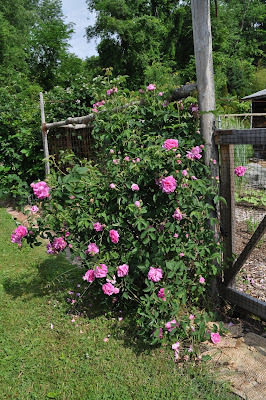 Flowering is desirable in some garden plants (fruit trees, broccoli, and, of course, flowers) and undesirable in others (lettuce, cabbage, and arugula). I’m not sure how I feel about the flowers recently appearing on my bamboo (Phyllostachys aureosulcata). Yes, bamboo! Bamboo typically flowers only after decades of growth, sometimes after more than a hundred years of growth. My bamboo is about 25 years old. most or all of them all over the world flower in unison, so death or weakening could be more widespread than my little grove. Which brings me to what is good about flowering of bamboo: It’s very interesting (but very unspectacular). I’m not too worried about my whole grove dying because I remember starting with a few pieces of bamboo which, perhaps, were not a single clone. 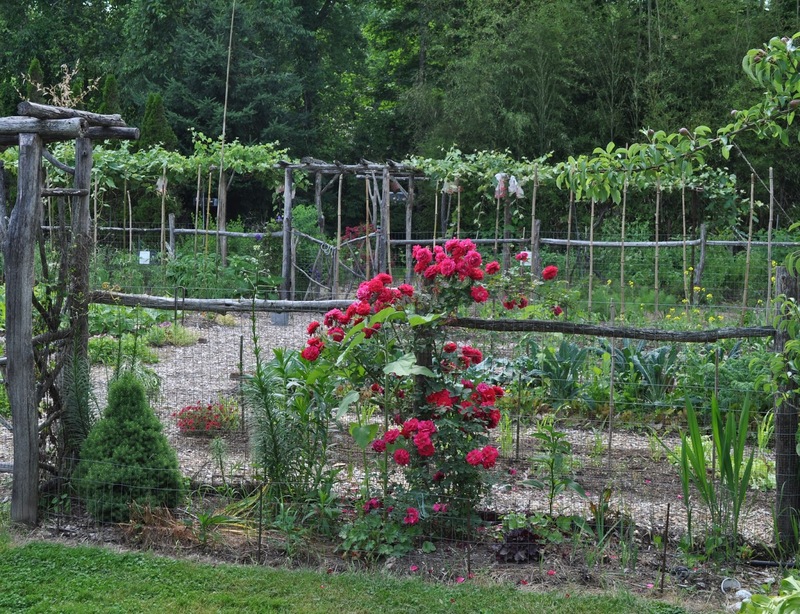 Also, lopping off flowering shoots would keep them from draining the rhizomes of energy. The best thing about the flowering is the possibility of collecting seeds. How exciting. Bamboo from seed. 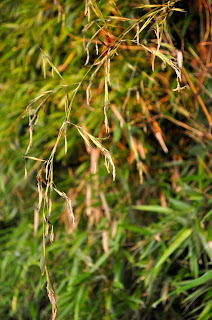 I won’t get my hopes too high because bamboos typically yield very little, in some cases, no seeds. On the other hand, sown in flats, the seeds allegedly sprout within only 3 weeks. o, does anybody else anywhere have flowers on their Phyllostachys aureosulcata? This species is commonly known as yellow groove bamboo, notable for the vertical, yellow groove on the canes and the bent “knee” often on the lower part of a cane. 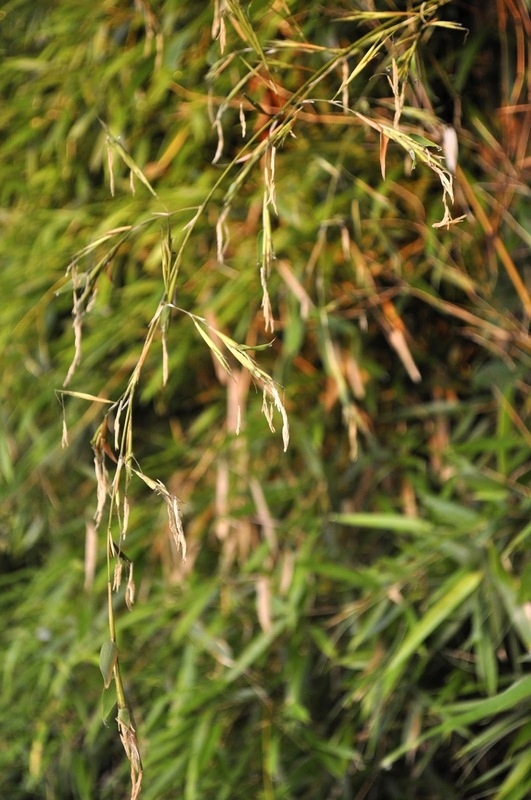 It’s one of the best bamboos for sturdy canes where winter temperatures plummet below minus 15°F. Searing heat and plenty of rain have made for Amazonian weather here, much to the liking of weeds (even with the “weed less” techniques I use, as described in my book Weedless Gardening). Rains in June were almost 200% higher than the average. Mostly, what’s involved in weeding here is periodic hand pulling, starting at one end of the garden, then working my way across the garden ripping out main roots and tops of weed plants. I’m spurred on knowing that, for instance, one lamb’s quarter plant can produce over 70,000 seeds, and having noticed the speed with which sharp quackgrass runners spread underground. I admit to having too much garden, so some neglected areas always get ahead of me. Like that patch of quackgrass growing and spreading happily between a couple of dwarf apple trees. Digging out the quackgrass would be too tedious. Tilling the soil would kill the plants, but many of the chopped up runners would take root and grow into new plants. Tilling would also expose buried weed seeds to light and more air -- just what they need to sprout. My tack is to mow the plants to the ground and cover the area, and a bit beyond, to account for underground spread of runners, with 4 layers of newspaper, overlapped. An alternative cover is grey resin paper, a building product, available on rolls that make the paper easy to roll out and, therefore, useful for larger areas. The paper smothers weeds in place, leaving the roots and tops to rot and enrich the soil. Sure, the paper looks ugly and can blow away. That’s why I wet it as soon as it goes down, then cover it with mulch, wood chips, in this case, because I happen to have a pile of wood chips available. 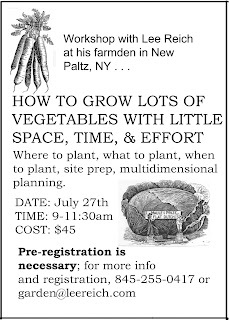 This method of killing weeds is effective, easy, quick, and I can immediately plant something -- a second crop of zucchini transplants is my plan -- in the mulch. As long as everything is kept moist, roots of the transplants can grow into the mulch and then into and down through the wetted paper into the moist earth below. wonder, given the weather and their being planted right in the compost piles. Nutrients, warmth, and water: What else would a warm-weather plant need? The compost piles are covered with EPDM rubber roofing material to seal in moisture and heat, and to keep out weed seeds. I cut two square flaps, each about 3 inches square, into the EPDM in which to “plug in” the transplants. 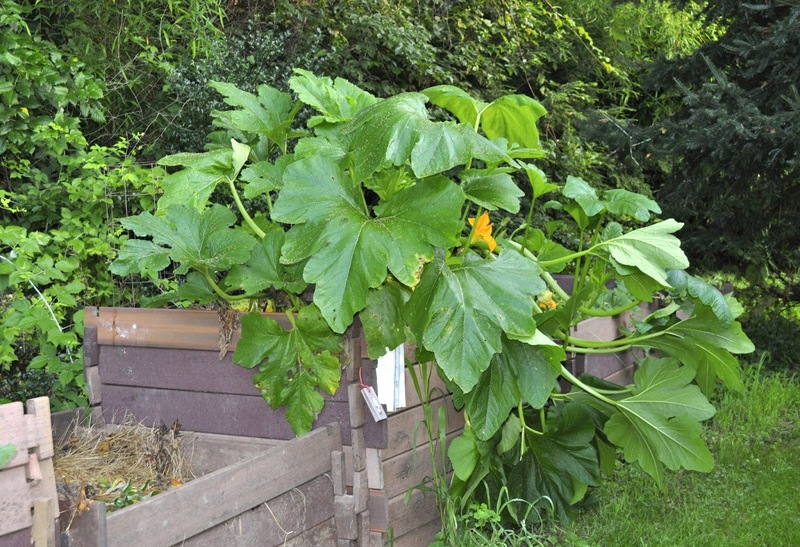 The compost, in addition to offering a smorgasbord of nutrients, also clings tenaciously to water, so the zucchini plants need essentially no care. In contrast, some care will be needed for the zucchini transplants that will go into the mulch between the apple trees. They’re at ground level, just right for rabbits, and the soil there is nowhere near as rich or moisture-retentive as pure compost. Then again, one can have too many zucchinis. 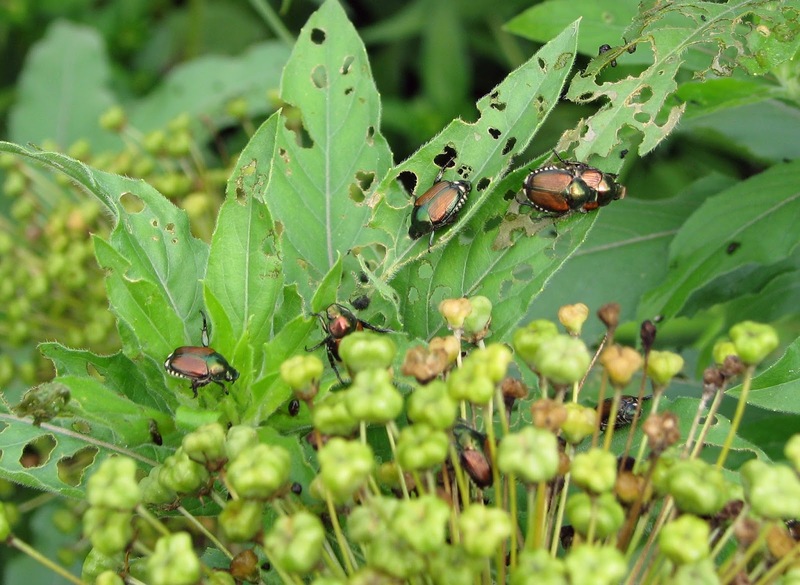 Just as cicadas are returning to their underground homes, Japanese beetles are emerging from these same quarters. (Do they nod to each other as they pass?) In contrast to the 17 year hiatus of the cicadas, Japanese beetles come up to cause trouble every year. Some years are worse than others, and the threat is hard to predict ahead of time. roots, and emerge the following season. (Beetle grubs are allegedly good eating as are, allegedly, cicada adults.) The beetle onslaught began on schedule last year, then fizzled out. I don’t know what to expect this year, except that I’ve already seen quite a few beetles. I also don’t know what to do about them. Milky spore disease is a bacterium that specifically targets the grubs in the soil. That seems ideal, except “there’s many a slip ‘twixt the cup and the lip.” Milky spore disease is more effective in theory and in the laboratory than out in real life. Beneficial nematodes are another potential fix for “beetlemania,” but nematodes are unfortunately also subject to that “slip.” Even if either beneficial organism was 100% effective, it would do nothing for the grubs in neighbors’ yards; those grubs morph into beetles that, once they spread their wings on neighbors’ lawns, could just fly over here. I’ve tried Japanese beetle traps and they were effective in the early years of light infestations here. After awhile, though, the traps attracted more beetles than they trapped even though placed about 300 feet apart at either end of my property. I’ve never tried, but like the idea of, strapping long, spiked soles to the bottom of my shoes and walking around spearing the grubs. It may be effective, but, again, does nothing about neighbors’ grubs unless you pace their yards also. Hand to hand combat is most effect and satisfying. The beetles are sluggish in early morning and easily flicked off leaves into a jar of soapy water, the soap preventing their escape. The problem, for me, is too, too many plants for hand to hand combat. The organic spray ‘Surround’, nothing more than kaolin clay, is a deterrent, but again, I have too many plants to douse repeatedly with anything, organic or otherwise. Good gardeners keep a close eye on their plants. 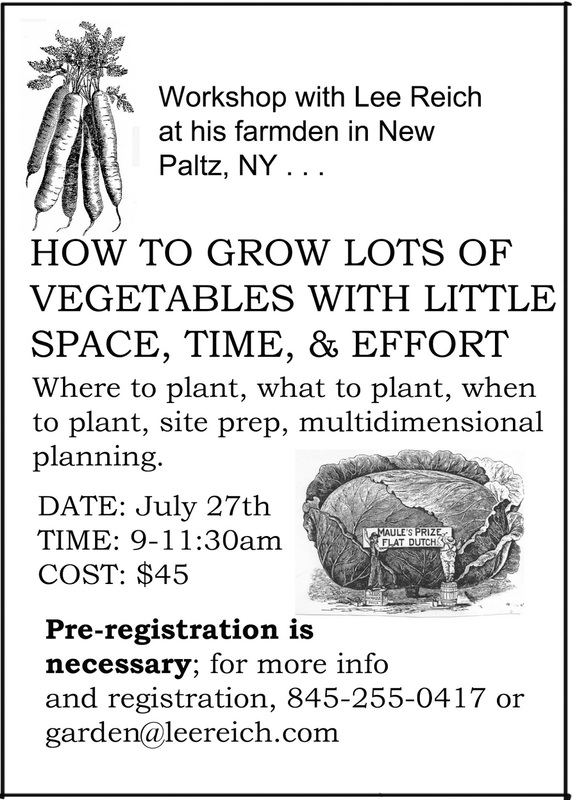 Good gardeners also -- I believe -- purposely don’t always look too closely. I have a friend whose fruit trees look almost perfect, the result of lots of pesticide sprays. 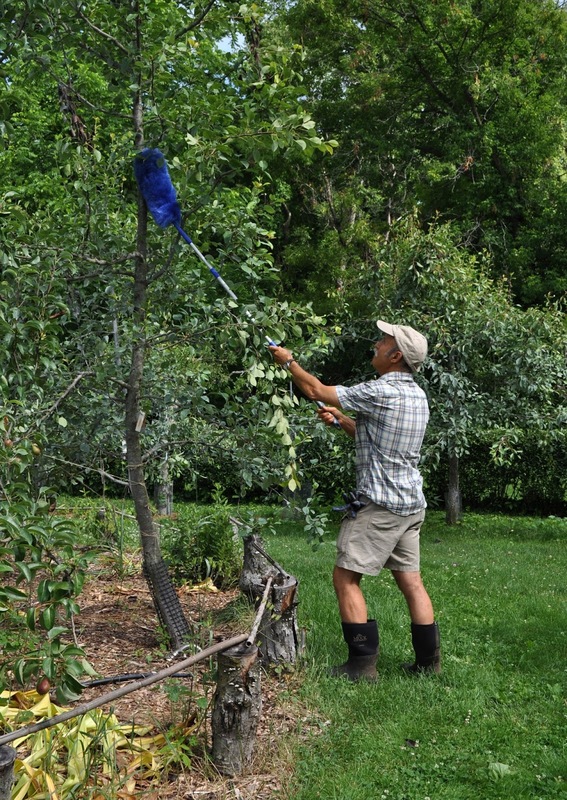 He could get by with a lot less spraying if a few holes in leaves or occasional wormy apples upset him less, which might happen if he looked less closely. Plants tolerate a certain amount of insect and disease damage. More than that, plants compensate, ratcheting up photosynthesis in what’s left of their leaves following damage -- up to a point. Anyway, the last sentence is the rationale for my do-nothing approach to Japanese beetles. I’m also reassured knowing that, although the beetles have cosmopolitan tastes, they don’t attack everything. Two years ago, for some reason, they skeletonized many leaves on one hardy kiwi plant (Actinidia kolomikta) but left a neighboring one (also A. kolomikta) practically untouched. beetles. The wheat harvest came in last week. 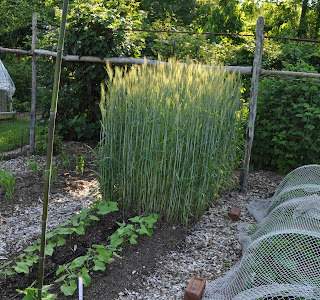 Lest you think that “came in” implies sacks of grain, the area planted was a mere 5 foot length of one of the 3 foot wide vegetable beds. This wheat was winter wheat, planted last September. The green sprouts grew through autumn, went dormant in winter, then started growing again in spring, beginning to develop seed heads once the plants were a couple of feet tall. Over the past few weeks the stalks rose to 5 feet high and the seed heads plumped up. Last week, rich soil, drip irrigation, and birds finally got the best of the upright stalks. Enough of them began to flop down and turn tawny that methought harvest was in order so we went at the stalks with pruning shears and threw them in a bucket. 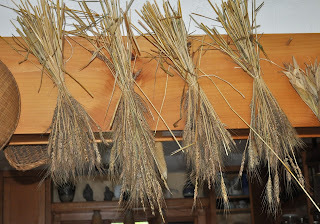 The stalks are now tied into small bundles that hang from a kitchen rafter to finish drying. could have planted right in the wheat stubble but decided, instead, to pull out clumps of wheat plants with minimal disturbance of the soil, spread on inch of compost, and plant. 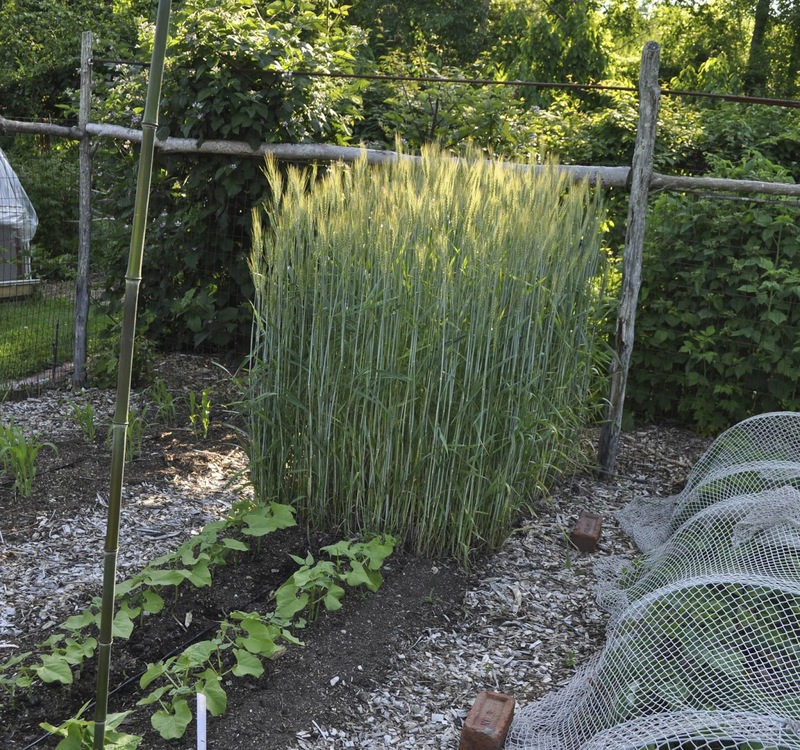 Grasses have extensive root systems (380 miles estimated beneath a single rye plant, another plant in the grass family), and all those wheat roots pushing and prodding the soil hither and thither left the ground in the wheat bed wonderfully soft and crumbly. Once the wheat harvest is dry, I’ll thresh, winnow, and grind it, then report on the yield, in loaves of bread per square foot of growing area. so little effort. All that’s needed, for everything except the gumis and Nanking cherries, is pruning and mulching. The gumis and Nanking cherries, both with their branches bowing to the ground under the load of red fruits, need no care at all! Gumis (Elaeagnus multiflora) are particularly abundant this year, for the first time ever. Either the bushes have grown large enough to pump out a large crop, or birds have been distracted by all the cicadas into leaving the gumis alone. Letting the fruits, which are flecked gold and the size of small cherries, hang on the bush until dead ripe gives time for the sprightly, sweet flavor to develop and the astringency to fade. It’s also a nice ornamental shrub, with leaves silvery on one side that are a good foil for the colorful fruits. Backtracking to a few weeks ago to another asset of this plant, sweet perfume from the flowers was drifting all over the yard. well as on last year’s stems. The breba crop, ripening earlier, develops on last year’s stems, a few of which I saved on the large tree in the greenhouse. The rest of the plant, like my other figs, which bear only on new, growing shoots, gets lopped back each autumn to 3 or 4 feet high. This crop, and for some figs this is the only crop, is called the main crop. So right now Green Ischia has a breba crop ripening on the 2 or 3 stems I left from last year, and a main crop developing which will begin ripening around the end of August, along with the main crop on the other varieties of figs. These crops can be harvested from plants in pots or, as is the case for my Green Ischia, plants growing in the ground in a minimally heated greenhouse. 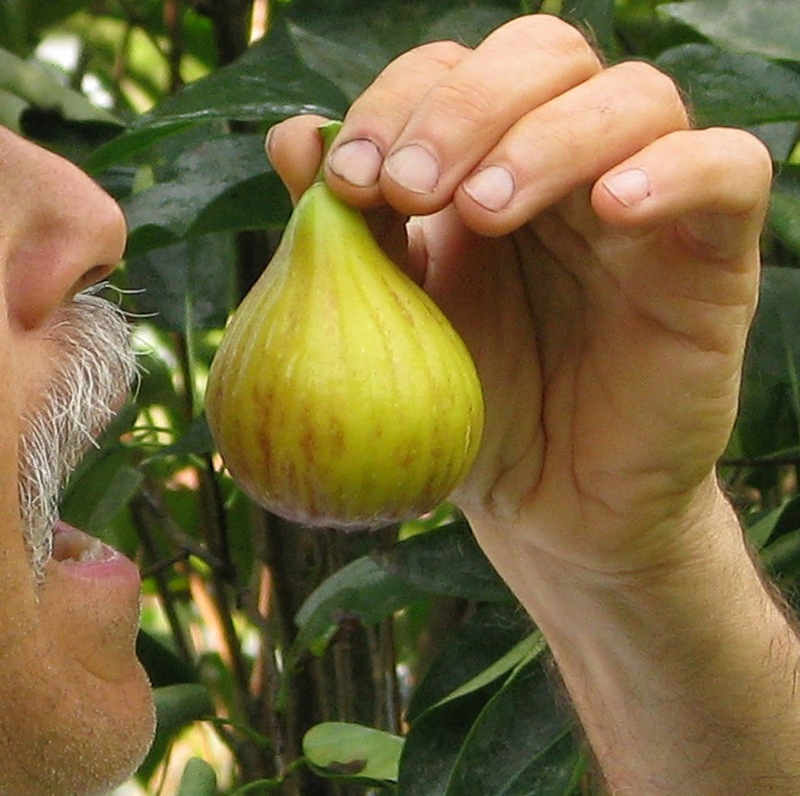 The advantage of in-ground in the greenhouse is larger plants and, hence, more figs. Some people spend their money on in-ground pools; I spent my money on a greenhouse for in-ground figs. The other fruits on my plate, with the exception of Nanking cherries, are familiar to most people. Many visitors have been sampling the Nanking cherries, and all except one were wowed by the fine flavor. 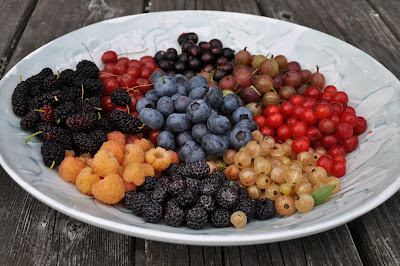 The fruits are somewhat small and soft, but, in addition to good flavor, earn their keep for their fecundity, their not needing any care, and for white blossoms that drench the stems in spring. 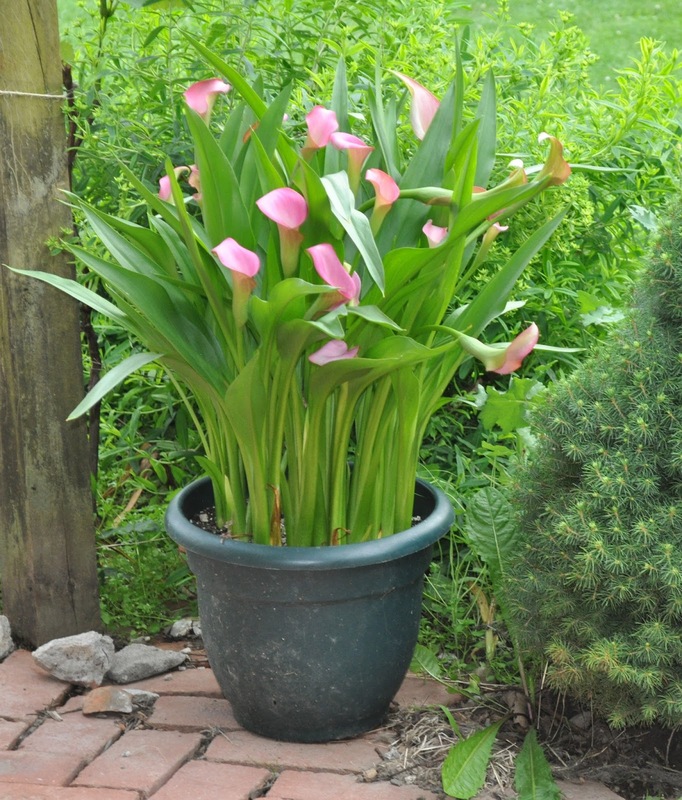 Soft pink, tubular swirls of calla lily (Zantedeschia spp.) flowers are like having a three dimensional Georgia O’Keefe painting right on my terrace. No, four dimensional, the added dimension being time, because the plants change day by day. flowers in summer; bring the pot indoors before the weather plummets below freezing in autumn; store in cool basement through winter; bring out again in late spring. 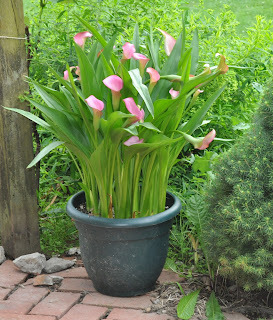 My main problem with growing calla lilies is that I’d like more of them than the one pot now sitting on my terrace. New plants are thankfully easy to come by, besides being gifted them, in this case from my friend Sara. Beneath the ground, the plants spread by rhizomes, which are specialized, underground stems such as those found beneath ginger, banana, lowbush blueberry, and bamboo plants. Rhizomes have a segmented appearance, just like stems, with each each node sprouting feeder roots as well as an aboveground shoot. Come autumn or late winter, I’ll cut up the rhizomes and multiply my holdings. So what’s hard to grow around here? Apples. If you wanted to know the most difficult fruit crop east of the Rocky Mountains, that’s it. Apples. The season started out perfectly, with good fruit set. A few well-timed sprays kept the snout-nosed beetle, plum curculio, at bay, as well as codling moth (the “worm” in an apple) and the fungus responsible for apple scab, whose effect is just what it sound like. But problems don’t end there. As curculio exits stage left, apple maggot moves in stage right (but can be controlled by trapping) and codling moth stays around. Orange blemishes from cedar-apple rust pock susceptible varieties and scab, despite the sprays, also becomes evident, the result of our incessant wet weather. Fruits are cracking from changes in soil moisture. And still in the offing are summer diseases -- black rot, white rot, and bitter rot -- that can ruin any fruit that survives other scourges. I can hear my mulberries, Nanking cherries, black raspberries, and other no-care fruits chuckling at me for all the care I lavish on my apples, to little avail. Dateline July 4: Cicadas are gone. Yeah! 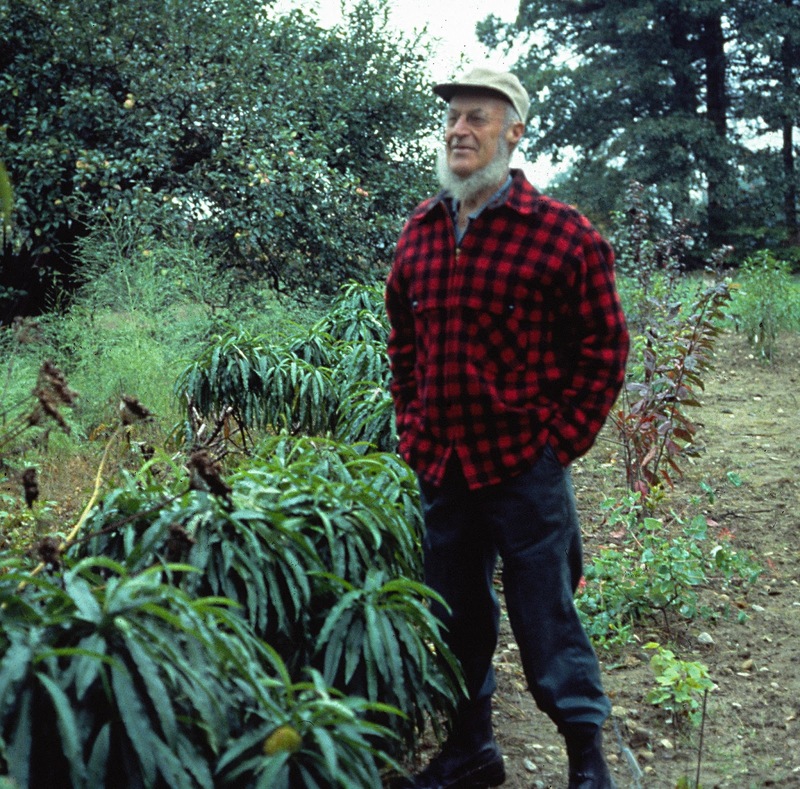 breeder extraordinaire, then retired, who had developed new varieties of such plants as persimmons, chestnuts, lilacs, cucumbers, soybeans, watermelons, and everbearing strawberries. The honey-sweet Fallgold raspberry, my favorite, was Elwyn’s handiwork, incorporating genes from Korean raspberries he found while working there for the U. S. Army. 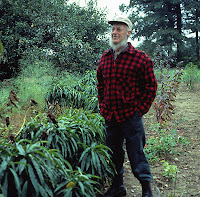 Now, many years later, I think of Elwyn’s words as Deb and I rush to net our small plot, two-hundredths of an acre, of blueberries. (Not so small, though, to obviate a very respectable harvest of about 190 quarts of delectable, organic, sustainable, artisanal berries from 16 plants!) 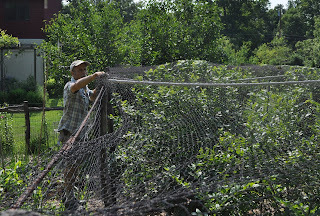 I append Elwyn’s words with “Covering two-hundredths of an acre of blueberries is a test of a marriage.” Nets can sag; tempers can thin; ladders can become unwieldy. We survived. My latest incarnation of blueberry protection against birds starts with an enclosure of locust posts about 8 feet apart, with rebar running through holes a few inches from their tops. The sides, as my friend Bill calls it, my “Blueberry Temple,” are enclosed permanently in heavy duty, plastic bird netting (www.bennersgardens.com). 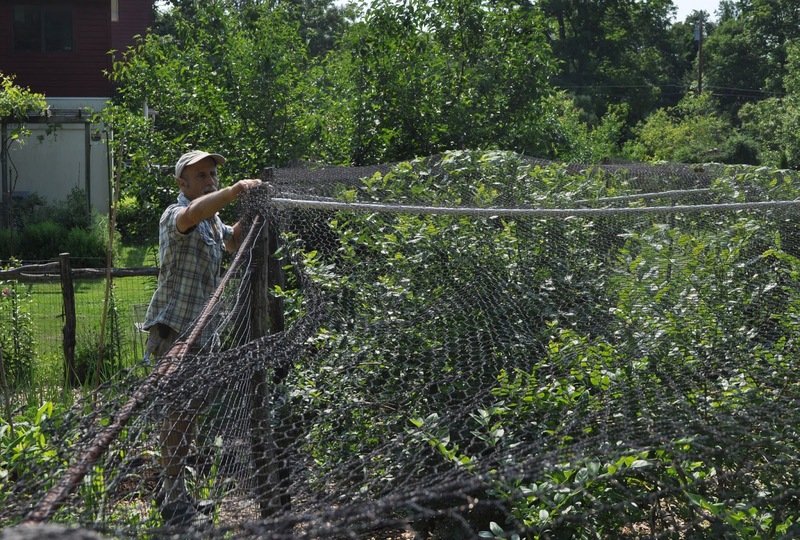 Eighteen-inch-high chicken wire at the bottom keeps rabbits from chewing through the plastic. that can get testy -- making sure to keep the net even on both sides and sufficiently taught. 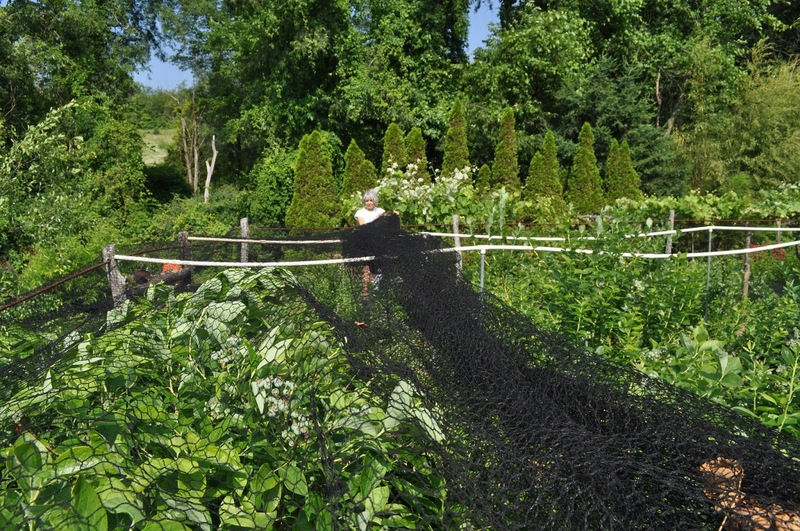 This year, the net was up in less than a half-hour, the blueberries were safe from birds, and the marriage was still intact. Pruning tomatoes is such a pleasant garden “chore.” As I look over each plant for suckers -- any shoot that originates at the upper part of juncture between a leaf and main stem -- I get to monitor the swelling fruits, do a health check on the leaves and stems, and admire the plants’ neat growth habit. The latter comes from my weekly pruning off of the suckers followed by tying of the main stems to adjacent bamboo poles. I can appreciate disorder in the garden but I also appreciate order. Disorder lends a pleasant, loosey-goosey atmosphere to the landscape. I find order more calming and an easier environment in which to satisfy the needs of each plant. 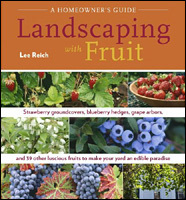 For the tomatoes, pruning and staking them -- which surely puts them in order -- also gives greater yields (per square foot of garden space), and fruits that are cleaner and a bit earlier. All this orderliness crumbles as August fades into September. By then, errant suckers get the best of me and the ever-elongating main stems reach the tops of their bamboo supports. Then where can they go? Sideways? Down? To an adjacent pole? No matter. By then, the end of tomato season is in sight and the plants pretty much do what they will as long as they keep pumping out juicy, red orbs. The novelty of cicadas has worn thin. Their electronic cacophony whines in various pitches throughout the day without a moment’s respite. If you saw me walking past any one of my many infested trees or shrubs, you might see my arms flailing about to keep airborne ones at bay. Thankfully, cicadas aren’t feeding on any plants. But their egg laying, beneath slits they make in bark, can cause damage. Young stems dying back do little damage to established trees and shrubs (gratuitous summer pruning of shoots? ), but can kill young plants. 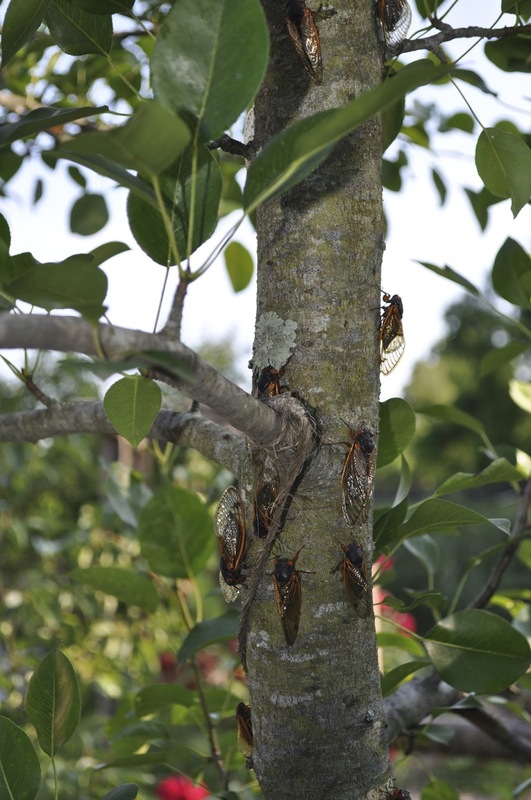 Here, the cicadas favor the lilac bush and pear trees and, to a lesser extent, the apple trees. I’ve gotten pretty good at snatching them by their wings. My chickens are very fond of the fresh, less so the frozen, catch of the day. This hand to hand combat feels good but makes but a small dent in the population. 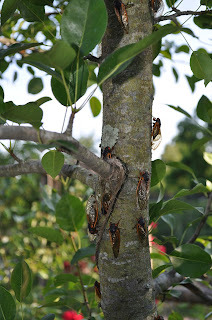 The other afternoon I could no longer stand the sight of so many cicadas clustered on the trunks of my 8-year-old pear trees. I needed a bulk method, so ran indoors to grab a dust broom. The dust broom was quite effective, sending cicadas flying everywhere. And then back onto the trunks. organically approved pesticide made from kaolin clay. The coating makes for unpleasant footing and egg-laying for a variety of insects, and it clogs their spiracles. 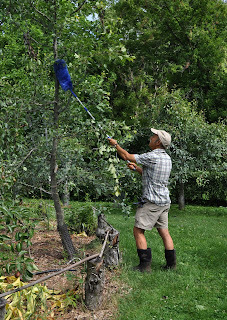 The ‘Surround’, which I applied only to the apples and pears, had but little effect on the cicadas. Cicadas on plants became statuesque; a few fewer flew back on, for awhile. Of course, the incessant cacophony emanating from the woods continued. Only a couple of weeks or so to go, and then a 17 year hiatus. 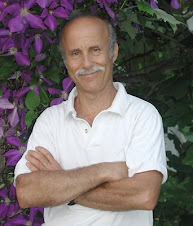 Perhaps it was youthful rebelliousness, but for years, for decades, I lambasted my father’s roses. 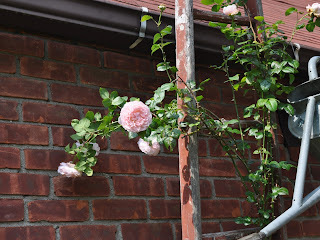 The roses reared up their colorful heads on the other side of the low, clipped privet hedge that bordered our terrace. If youthful rebelliousness was at the root of my rose aversion, that rebelliousness has lasted well beyond my youth, right up to the present day even though those roses are no more. 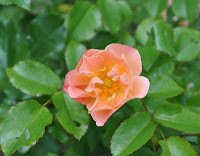 The plants were hybrid tea roses, in various colors. You’ve got to admit that the shrubs themselves, typically with a few gawky stems topped with disproportionately large blossoms, are not much to look at. The pointiness of the blossoms, a sought-after quality among hybrid tea breeders, is, for me, particularly unattractive. Couple that with the blaring colors and you get the picture, for me, that is. Hybrid tea roses are not particularly tough plants, succumbing to insects, diseases, and winter cold. Which is why my father grew them practically as annuals, often having to replace dead bushes with new ones. What a waste. Times change, and over the last few years I’ve become a fan of roses. No, not hybrid tea roses! 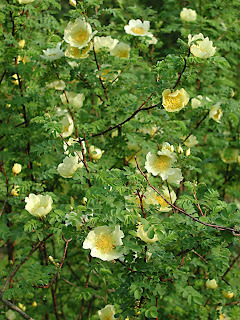 Other types of roses, of which there are many. resistance; a full-bodied, corpulent shrub; cup-shaped or single flowers; pastel colors; fragrance; and repeat-blooming. Hybrid tea roses generally lack all these qualities, except for repeat-blooming. Some species and old-fashioned roses tend to have the qualities I seek. 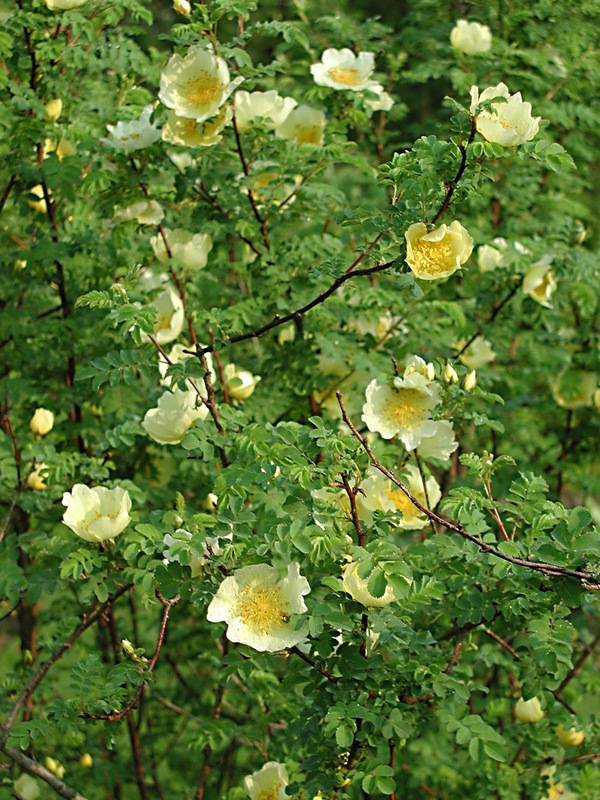 Father Hugo’s rose, Rosa hugonis, is one such rose with single, small, soft yellow blossoms and ferny foliage. It’s supposed to be a tough rose, but mine hasn’t yet lived up to that billing. Too much weed competition, perhaps. Rugose rose (R. rugosa) is another outstanding rose, this one living up to its reputation for being tough. So much so that it’s considered invasive in some places. Still, I like it for its nonstop blooms of single, usually pink-red flowers, its strong fragrance, and its nice hips -- fruits that is, very tasty. be my old-fashioned Rose de Rescht. Its petals are soft cerise in color, and are crumpled like crêpe paper with just a bit of organization on the ends of flower stalks. The fragrance is heavenly, to my nose the best of any rose. won me over to my father’s camp. 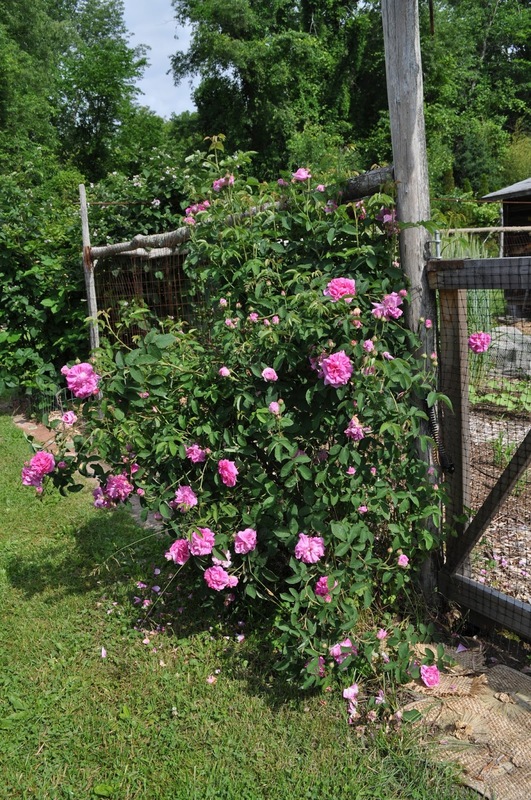 One such group of moderns are the Knock Out® roses. Very unclassical in appearance, with short, wide stature and mostly single-petalled flowers, these roses are tough and carefree, and bloom all season long. The colors would be gaudy except for their being pleasantly subdued by the small size of the flowers and their lush and abundant backdrop of glossy, green leaves. of the old-fashions with the repeat blooming and pest resistance of the moderns. Right now, Strawberry Hill and L. D. Braithwaite are growing very well in my garden, partly the result of a very mild winter. My father eventually came around to my way of thinking and gave me free rein to rip out his hybrid tea roses and replace them with a mix of other perennial and annual flowers. The view from the terrace was transformed into a spring through autumn panoply of colors and forms from the likes of tree peonies, ligularias, lungwort, bleeding heart, and other perennials. The one constant following the transformation was the line of begonias or marigolds that marched along the edge of the bed, just as they did when the bed was home to roses. Mulberries have ripened, so a taste test was in order: Illinois Everbearing vs. Oscar vs. Kokuso vs. Gerardi Dwarf vs. random seedling. Oscar was best with Kokuso and the seedling a close second, followed by Illinois Everbearing and then Gerardi Dwarf. These ratings aren’t writ in stone, for me, because confounding everything were big flavor changes that depended on slight changes in ripening -- I think. Note that black mulberry -- the species Morus nigra -- was not in the running. That’s because the fruits won’t be ripe for awhile and because, I know from experience, it’s far and away the best of them all.